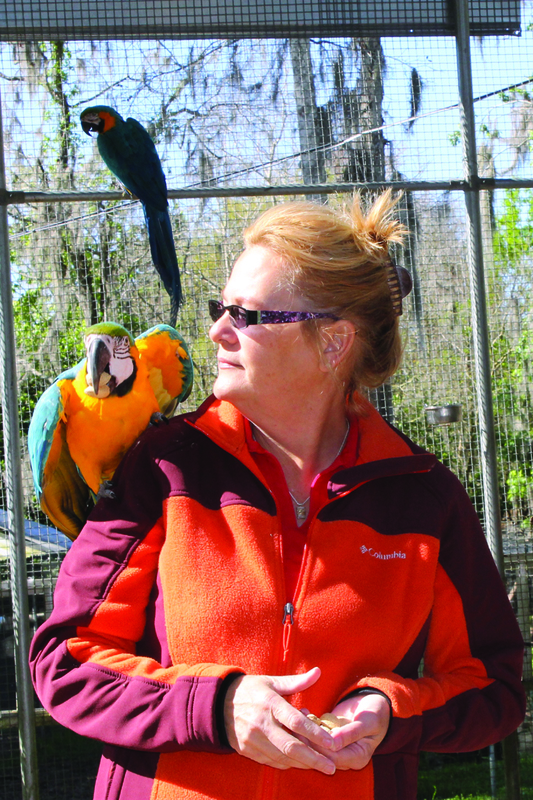 While taking courses to become a veterinarian, “Bird Mother” Patricia Norton discovered her love for exotic birds. With the support of her husband, a decision was made in 2000 to open a parrot sanctuary. She now resides on-site in Wesley Chapel with her husband and two children, John and Katie. 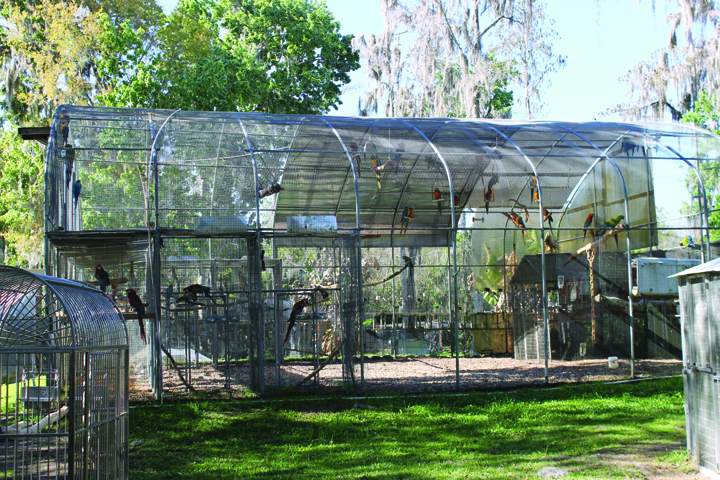 Upon arriving at The Florida Exotic Bird Sanctuary, one can hear all of the chatter and notices the beautiful birds flying and socializing in the large flight cage (currently holding 42 macaws). 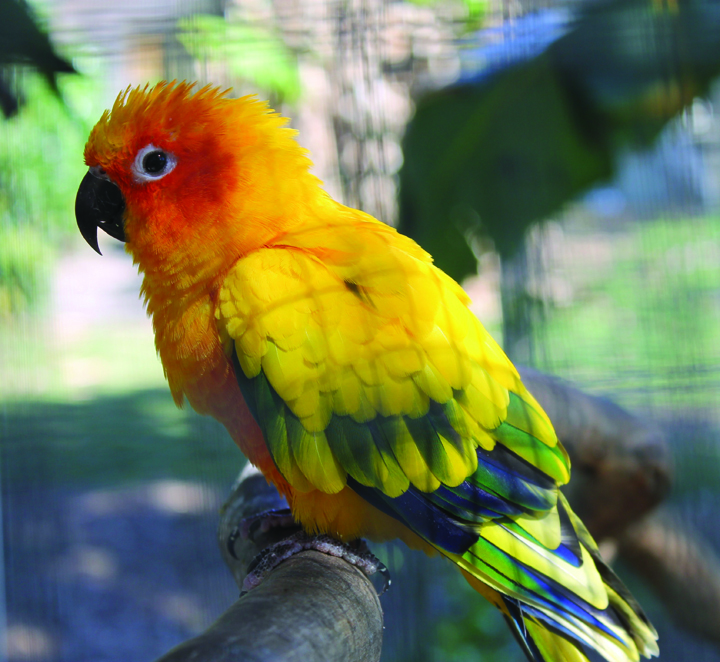 A 501 (c)(3) non-profit, the Sanctuary accepts birds from all over the U.S. Birds are flock animals that should not be kept in cages. According to Norton, it is becoming an epidemic as people realize what they are getting into with these exotic birds. They can live up to 80-100 years and it is more than a lifetime commitment. Owners who give up their birds all have their different reasons, but most of the time it comes from the realization that the upkeep for these birds is just too much to maintain. Ninety percent of the birds that come to the Sanctuary are not abused, but just need a new roof over their head. There are birds that arrive with special needs. They are kept separate. A bored or stressed bird with its feathers plucked needs special attention. The new birds that arrive are also kept separate until they can acclimate. The birds are also separated by breed. Smaller birds have to be kept separate from the larger ones so that they are not hurt. Because it is a sanctuary, the birds are not offered for adoption. It is therefore a forever home for the birds that reside there. Norton will not breed the birds either. The Sanctuary will take birds from owners who have to give them up for any reason, requesting that the owner help sponsor their bird for the first five years. For Macaws, it would cost $1,000 on intake and then $83 a month for the next four years as the Sanctuary does not receive funding other than from donations. Smaller exotics would cost less per month. “We need to expand; the cages are full.” Norton said that over 370 parrots now call the Sanctuary home, but there are currently 200 birds on the waiting list and it keeps growing. The birds’ food (pellet and seed diet), plus fruits and vegetables, cost $2,200 a month. It costs about $100,000 annually to run the facility. It will take about $200,000 to rescue 1,000 birds within the next five years. Norton went on to say that she cannot do this alone. She has a board of directors, which includes a veterinarian, a small staff and a great group of volunteers, who help every day to clean, feed and help with anything that needs to be taken care of. Norton hopes in the future to be able to eliminate any of the smaller cages that are currently used and to have all larger flight cages. With dreams of expansion, she has recently bought five acres of land in Hudson that she plans to use for a new Sanctuary in a few years when enough funds are raised. The goal is to move the more than 370 current parrots and to make room for additional birds. At the new location, Norton also plans to open a wildlife rescue and will plan to open the new sanctuary to the general public so that they can visit and be educated about the upkeep and responsibilities that go along with raising exotic birds. The Bird Sanctuary is currently open to tours by appointment only. Monetary donations are always welcome. Bird cages, bird toys, nuts, peanuts, heaters, misters, and food is also accepted. A wish list is on the Website. For more information, to make a donation or learn about volunteer opportunities, visit flabirdsanctu ary.com or e-mail Norton at birdmoth er@flabirdsanctuary.com.